All of us have experienced moments that forever changed our lives. Sometimes we make choices with careful forethought. At other times change is thrust upon us, and we must act quickly, regardless of consequence. Later we may wonder who we might have become if we had chosen otherwise. A hotel fire in Tokyo provides a cover for a man and a woman to disappear from their lives and build a new life together in a remote village in Japan, until one day the past comes back to haunt them. In Dark Mirror a man notices a dim reflection in a mirror in a dusty photograph which leads him to a half-brother he had never known. A stormy night in 1930’s Los Angeles and a mysterious woman running away from Fascist Europe gives Alan Armstrong a way out of an obligation that is about to ruin his life. A ghost drifting through the empty halls of a hotel, endlessly replaying her longing and her death, provides redemption for a struggling writer. Sarah blames herself for the death of her younger sister, and has struggled for ten years to get past that guilt and regret. Then on a sunny afternoon in New York, she finds absolution from a source she never imagined. 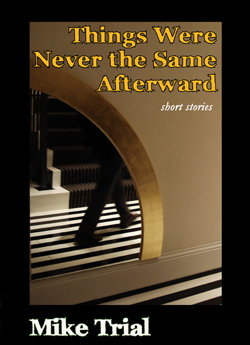 Things Were Never the Same Afterward collects eleven stories of people whose lives changed forever in one crucial moment.